This is a painting I call, "Alma Tadema with TV." It all started when a model of mine was lying on the modeling stand next to my easel and going on and on about TV shows she had watched the night before. I don't have cable or watch TV except movies so this was sort of a mystery to me. I did some sketches of her in that position and some photos. 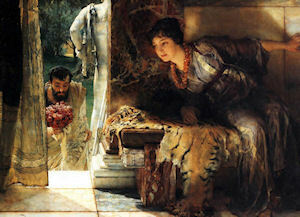 Later that week I was looking at a picture book of Sir Lawrence Alma-Tadema's work. I ran across the image below of "Welcome Footsteps" painted in 1883. Since most of the TV shows my model liked were involving romance or datiing in some way it seemed fitting to use this painting as a starting point. She was always talking about waiting for the right "hunk" in her life so the muscular statue outside seemed to be in keeping with her dreams. Wasting her time in front of a TV when the beautiful real world and her dream was just outside. The work I did on a 30 x 40 canvas was taken from this painting with the obvious changes. Some don't see the back of the TV or the remote on the floor at first so the title can be confusing. The couple who bought this piece were very much fans of Mr. Alma-Tadema and nudes so it was a good match. Footnote. The work of Sir Lawrence Alma-Tadema is worth studing if you are interested in Hollywood movies, Roman history, storys of Pompeii or the Victorian period in art. My own observation, if I were to cast someone to play him in a movie it would be Anthony Hopkins. [grin] I think he does look like Sir Lawrence from his photos.